At holy sites around the world, it is traditional for many pilgrims, especially Roman Catholics, to leave behind various objects called “ex-votos.” These symbolize their visit and their reason for their journey. Fortean Picture Library. Ex-votos (literally, “according to the vow”) are objects left at holy sites that document in some way a petition made by a pilgrim. Among the most simple of ex-votos (also called votives or, in Spanish, milagros) are simple published notices ofthanks to a patron saint for help received, which in Catholic countries may be published in the newspaper as a classified ad. More involved exvotos, those of most interest to anthropologists, will include an illustration of the object of a prayer and some text describing what occurred or what the petitioner wishes to occur. These may be very simple or very elaborate and made out of a wide variety of materials. At healing shrines, exvotos associated with an individual’s illness (such as crutches, canes, or wheelchairs) or representations of body parts are often displayed to show the effectiveness of intercessions to the resident saint. Today, ex-votos are most identified with Roman Catholicism, but they have been and continue to be used in a variety of religious traditions. Found in ancient religious sites, ex-votos have been a significant means of discerning the exact purposes to which worship at the site was directed. The ex-voto is activated after its construction by leaving it at the holy site and/or close to a representation or relic of the saint/deity to whom one is making a request. Among the most famous of ex-votos are those painted on pieces of tin that may be seen as shrines throughout Latin America. These usually picture events of a healing along with words of thanks. Ackerman, Jane. “The Theme of Mary’s Power in the Milagros de Nuestra Senora.” Journal of Hispanic Philology 8 (1983): 17–31. Coulter, Lane, and Maurice Dixon, Jr. New Mexican Tinwork: 1840–1940. Albuquerque: University of New Mexico Press, 1990. Egan, Martha. Milagros: Votive Offerings from the Americas. Albuquerque: University of New Mexico Press, 1991. Mayes, Frances. Ex Voto. Barrington, RI: Lost Roads Publishers, 1995. Salvatori, Mariolina. “Porque no puedo decir mi cuen-to: Mexican Ex-votos’ Iconographic Literacy.” In John Trimbur, ed. Popular Literacy: Studies in Cultural Practices and Poetics. Pittsburgh, PA: University of Pittsburgh, 2001, 17–42. More important still is the fact that while there is plenty in the exhibition about the supposed influence of the Virgin and Saints on the daily lives of believers, well illustrated by the ex-voto panels (Fig. 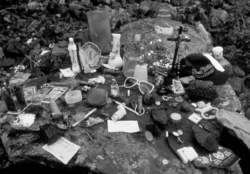 Mas a medida em que vai se desenvolvendo a trama, o personagem vai apresentando desvios de comportamento e estranhos habitos--contatos espiritas, com uma especie de altar fotografico e de ex-votos montados na casa que serve de cenario, delirios, sonhos, resultando em um desequilibrio psicologico. Gomes demonstra que uma pluralidade de objetos--nao apenas religiosos, mas tambem cotidianos, pode adquirir dimensoes sagradas ao serem ofertados como ex-votos, mas que os agrupamentos que se formam, ate certo ponto inusitados para um observador externo, podem provocar sensacoes de desconforto, uma especie de incomodo com a taxionomia propria da devocao, que coloca lado a lado o que deveria estar separado, que produz metaforas, metonimias e sinedoques inusitadas, que inverte as causalidades obvias e opera com uma logica do envolvimento e da participacao. ex-voto offerings, liturgical practices, and patronage associations) interact with written hagiography to construct the life of a saint. From its beginnings in 15th-century Italy through its spread to the New World in the 16th century, ex-votos have played a role in the daily lives of the faithful, especially in Mexico, and continued to be a popular expression of faith and healing into the late 18th and early 19th centuries, the most prolific period of ex-voto production. The traditional Spanish conception of artistic revelation arising from religious fervor and the celebration of the agonies and ecstasies of the saints likely played a role in Goya's conception of his ex-voto. The author looks at literary evidence (chapter one) as well as providing her thoughts on deposits of ex-votos (chapter three) and domestic cults (chapter four). Todo esse manancial de objetos referidos constitui diferentes formas de ex-votos. As tabuas votivas: mais uma fonte para a historia do nosso "latim vulgar"
The tradition of ex-votos influenced Frida Kahlo and Diego Rivera, and they can continue to influence children today in creating their own expressions of gratitude. The silver chest was commissioned, perhaps by Piero de' Medici, the patron of the sumptuous tabernacle and oratory that he rebuilt between 1448 and 1451, to house the most precious of gifts and ex-votos donated in homage to the Annunciate Virgin. Her effort to do this is sustained by buoyant prose and the seining of a wide array of sources, which include maps, hydrographic and maritime reports, agricultural surveys, engineering, surveying and government reports, and travelers' descriptions, along with letters, ex-votos, poetry, and postcards. His latest book moves to yet another topic: the visual representations of cities, a category that goes well beyond such usual artifacts as maps and city views to include commemorative paintings and prints, ex-votos, and folding screens.